A small hints & tips section for veteran and would-be scam baiters. Please remember these people are CRIMINALS and should be treated as such. Under NO CIRCUMSTANCES must you enter into any communications with these people unless you feel you are adequately prepared to deal with them. Under NO CIRCUMSTANCES give them ANY real information about yourself. While tales contained within EATER may show hilarity, rest assured these criminals feel differently and will not hesitate to retaliate given a chance. The tips below are for INFORMATIONAL PURPOSES ONLY. 419eater.com cannot be held responsible for what you decide to do with the information. If you are unsure of what you are doing please DO NOT ATTEMPT TO ENGAGE THESE SCAMMERS! Question: How do I get a 419 scammer to contact me, I'd love to get into this scam baiting sport?! Answer: Well, you are probably one of the lucky ones who haven't received any contact from them yet! The first place to look is in the spam folder in your existing email account. Most email providers have such a facility and, depending on the efficiency of their filtering, all or most emails from scammers will end up in there. DO NOT REPLY TO THE SCAMMER FROM THAT ACCOUNT!! Set up a new one totally separate from your existing account. Maybe you don't have a spam folder or just aren't on scammers' radars. What do you do? Easy! Browse to our SURPLUS 419 SCAM LETTERS forum and pick up a suitable scammer there. Question: How do I contact the scammers without using my real email address? Answer: There are plenty of web based free email services you can use. Pop "free email provider" into the search box on Google and you will be provided with a multitude of companies keen to offer you a free email account. Question: Can I reply to a scammer even if the initial email was not sent to my email address? Answer: Sure! Lads are greedy and just care about you paying! They send out thousands of messages. Rarely will they check to see if your reply comes from an address they originally emailed. Copy and paste the original email into the body and reply away. Often, you don't even need to do this, just copying the subject of the original with "Re:" before it in your own reply. Question: What if the scammer wants to talk on the telephone? Answer: You have a choice: choose to speak with them, or don't. Many baiters use Skype, Google Voice, or the Voice Chat feature of Facebook to converse with lads. Others will use a disposable, pre-paid mobile phone. But, it's not free for you (or the lad, so there's that). Like all baiting related activities, it needs to be done in a safe manner with no real life details attached to the account. Do not appear in video chats with the scammers. It is possible for them to record these and re-use them, posing as you. Alternatively, you can sign up to a redirect service, such as those from flextel.com or dmclub.net. These provide you with a UK geographical number (dmclub) or a UK "mobile" phone number (flextel) that will cost the lad to call. It also stops lads calling you using a VOIP service. If you choose to not converse with them, you can provide them a number to "text" or "SMS." There are services that provide these numbers, including Google Voice. Or, be prepared with an excuse from the beginning. Hearing impairment is a too common excuse, so think on this first. Question: I have the scammer on board, but now he's asking me for my address/occupation/bank details. What do I do?! Answer: Much like creating your baiting email address/persona, you get to be whomever you want and may live where ever you want (almost). To avoid involving any Innocent Third Person (ITP) in your bait (and this includes law enforcement, the government, etc), make up a random address in the location of your choosing. Do check with an online mapping service to verify it is not a real place. Should the lad question you on this, simply explain it's a new street and hasn't been updated on online maps yet. For bank details, pick a bank (or make up your own) and generate an account number, routing number, IBAN, SWIFT code, or whatever you choose. Scammers won't be sending you any money (although they may attempt to use you and "your account" for money mule schemes. Should you need further help, there are Fake Name Generators that may be found with a simple internet search. We highly encourage you to check the information generated to make sure it does not belong to a real person. Question: I've sent my bank details etc. and now they are asking me to make a payment to them. HELP! Answer: This is where baiting and wasting their time really comes into play. You should have some plans together to delay making payments. Originality helps here, but if you have none, blatantly ripping off the work of other baiters is highly encouraged. "Imitation is the sincerest form of flattery," right? The whole idea is to waste the scammers time so they have less opportunity to focus on real victims. Question: The scammer is asking for some of my identification or a copy of my passport. Where do I find some fake ID to send to him? Answer: We discourage people from sending fake identification to scammers. There is the possibility the scammer may use the very ID you send to him to fool a real victim. Although you may create what you think is a totally unbelievable ID featuring some well known celebrity or funny name, there is a possibility a real victim may be totally unaware of that celebrity or perhaps comes from a country where, because of the language differences, they do not recognize the amusing name as such. You will find plenty of suggestions for sending garbage files instead of IDs to a scammer on our very busy FORUM. One favorite method is to select a random (and large!) .DLL file and rename it to something like "passport.jpg". You can always find one of these in the Windows/System32 folder on your PC. Copy the .dll to your desktop (do not rename it in the System32 folder!!!) and rename it there. A much safer way to create such a file is to use "File Destructor" here to create a large unopenable file. Of course the scammer will not be able to display it on his computer or smartphone, but that's not your fault is it?! Question: What if I need or desire some one-on-one help from a veteran scam baiter? Answer: Once you have joined our site and introduced yourself, you will be eligible to join our Cherrie Mentor Progam. 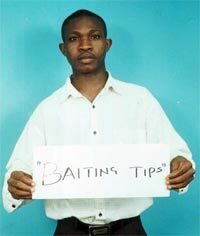 These carefully selected members will be able to advise you until you become comfortable with baiting. Question: Are these people dangerous? Answer: It's a verifiable fact they are liars, thieves, and criminals with absolutely no sense of remorse. They will do everything in their power to get every last dollar out of their victims, including confessing and playing the "woe-is-me" card. There are some scammers that have gone as far as kidnapping and murder. But, you're baiting safe, remember? So, you won't be engaging them with any information that could lead to who you really are outside of your character. While the majority of advance fee fraud scammers appear to be concentrated in West Africa, they can be found just about anywhere an internet connection can be made. It is not unusual to experience some serious abuse from a scammer at some point, when things aren't going their way. While we find the antics hilarious, you can bet they don't. Almost every veteran scambaiter can tell a story about a lad who filled their inbox with spam or had thousands of email bounces sent to their inbox. Upset them, and you will get the occasional phishing attempt or an enterprising lad will send a virus. Baiting safe means taking into account the possibility any file you open or link you click might be tainted. But, shouldn't you be wary anyway? Question: Do you have any other tips? Answer: Use common sense. Give the scammers nothing that will make them better at what they do or will help educate them. Make them do the work. IF YOU SUSPECT YOU ARE A REAL VICTIM OR VICTIM-TO-BE! Scamwarners.com is better suited to helping and advising in these situations. 419Eater does not advocate "revenge baiting" or continued interactions with scammers by victims. We encourage victims to stop all communications with their scammers. Typically, the scammers will quickly get the message and move on as they cannot afford to waste time on people they think won't pay. If they continue to email, phone, or send sms messages, close or change your accounts. If you have given the scammer personal identification, such as a scan of your passport, or your banking details, then to cover yourself you would be advised to alert your local law enforcement. Get some kind of proof you have contacted them (such as a case number) for future reference. Scammers will often use the IDs of real victims in order to fool future victims that they are you for instance. Sometimes, they will even use this information to create fake social media profiles to scam new victims.